This month, I cooked for our monthly Ina linky, weeks ahead of time and promptly forgot about it so here I am, at the last minute, scrambling to get something out. 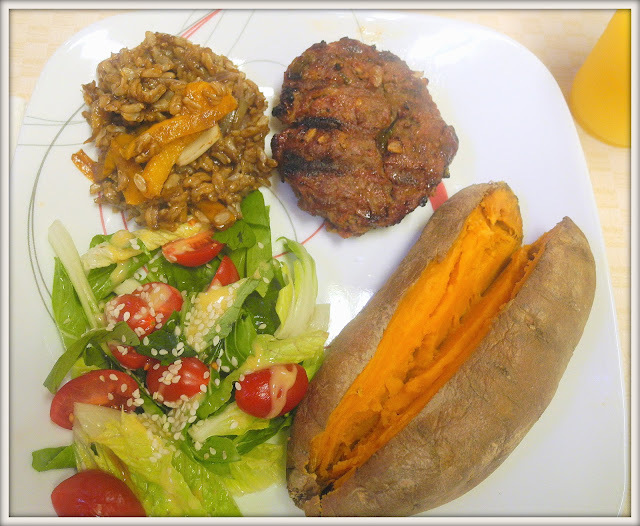 I had taken ina's meat loaf and made burgers from the mixture, rather than a meat loaf and they came out, just right. The recipe, I used can be found here. We grilled the burgers instead of baking the meat loaf. They stayed together which is something, I was concerned about. I think this is the correct photo but I am no longer sure of this. Looks OK to me :) But whatever it is, it does look delicious! It is a great picture - so it must be the right one. These sound really good. I think I'll have to give this a try burgers are my favorite. I'm new to Ina Fridays. I linked up the Foolproof Baby Back Ribs. We do a lot of grilling around here. What a creative idea. Who'd have thought to make burgers from meat loaf? Great idea! I would never have thought her meatloaf recipe would hold up as a burger. Great idea, Chaya! Very creative dish and what a colorful looking plate!